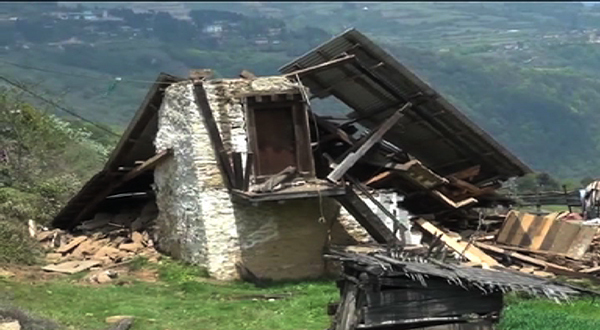 A falling boulder at Tashiling under Tangsibji Gewog in Trongsa destroyed a traditional house on the night of April 26. The house is located below the road where widening works are currently being carried out. However, there were no casualties since people living in the house were asked to vacate, due to the risks of falling boulders. According to the contractor executing the widening works, the overhanging rock fell down after they carried out the blasting that night. The Gewog administration said residents of two houses were already notified to vacate their houses. But they were not given a place to live in. “They told us not to stay here but never gave us a place to live in. Although the victim has a house to stay, for me since this is my only ancestral house, I don’t have anywhere to go. We cannot stay in others house for long,” shared one of the residents, Kumbu Tenzin. Let alone the house, even the fields were not spared. “Now my house is damaged. Even my field is filled with boulders. For fear of falling boulders, I cannot work during daytime,” shared the affected house owner, Ugyen Norbu. The joint verification team from Gewog and Dzongkhag disaster management said it was a manmade disaster and the victim is not eligible for rural insurance. However the Chief Engineer from Department of Roads, Taugay Choedup said the contractor should be responsible for any losses as the road stretch is already handed over to him. After much discussion between the Gewog, contractor and disaster management team, the contractor agreed to provide one of the residents with tarpaulin sheet for temporary shelter until the widening work is over. The contractor said the widening work in the area might take about a week to complete, if everything goes well.